The American Association of University Women is Accepting Applications for its American Fellowships Program! The annual program supports women scholars who are completing a dissertation, planning a research leave from an accredited institution, or preparing research for publication. Applicants for all fellowships must be a citizen or permanent resident of the U.S.. Candidates are evaluated on the basis of scholarly excellence; quality and originality of their project design; and active commitment to helping women and girls through service in their communities, professions, or fields of research. See the American Association of University Women website for complete program guidelines, information about previous fellows, and application instructions. Applications are open August 1–November 15! Mark Your Calendars for Marketplace Wisconsin November 16-17, 2016! Are you ready to start or grow your business in Wisconsin? Each year, Marketplace helps minority, women and veteran-owned company representatives learn about doing business with state, federal and local agencies as well as corporations. These markets represent billions of dollars of annual purchasing with special programs to include minority, women, veteran and disadvantaged business owners. Meet with potential buyers, identify funding sources, connect with business assistance resources and build their capacity at Marketplace. 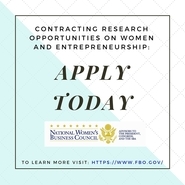 Take Part In The National Women’s Business Council Accelerators and Incubators Survey Today! Find Out How Women Entrepreneurs are Key to Accelerating Growth in the July 2015 Entrepreneurship Policy Digest. The new Entrepreneurship Policy Digest explores barriers to women entrepreneurs and offers five policy recommendations to address the gender gap.